If al Qaeda fighters want to murder Hezbollah fighters and Hezbollah fighters want to return the favor, who in their right mind would want to stand in the way? . . . If one branch of Islam wants to be at war with another branch for a few years — or decades — so much the better for the non-Islamic world. Mass civilian casualties in Aleppo or Homs is their tragedy, not ours. It does not implicate us morally. And it probably benefits us strategically, not least by redirecting jihadist energies away from the West. It's true that the price of crude declined sharply almost every year of the war, but that only goes to show how weak the correlation is between Persian Gulf tensions and oil prices. Otherwise, the 1980s were the years of the tanker wars in the Gulf, including Iraq's attack on the USS Stark; the hostage-taking in Lebanon; and the birth of Hezbollah, with its suicide bombings of the U.S. Marine barracks and embassy in Beirut. Iraq invaded Kuwait less than two years after the war's end. Iran emerged with its revolutionary fervors intact — along with a rekindled interest in developing nuclear weapons. In short, a long intra-Islamic war left nobody safer, wealthier or wiser. He finds that the fighting left the West morally tainted. The U.S. embraced Saddam Hussein as a counterweight to Iran, and later tried to ply Iran with secret arms in exchange for the release of hostages. Patrolling the Strait of Hormuz, the USS Vincennes mistakenly shot down an Iranian jetliner over the Gulf, killing 290 civilians. Stephens concludes that "inaction only provides moral safe harbor when there's no possibility of action." The Iraq-Iran war of 1980–88 and the Syrian civil war differ in a decisive way. The former directly involved the world's energy center, the latter does not. The Iraq-Iran war threatened the global economy, the Syrian conflict does not. 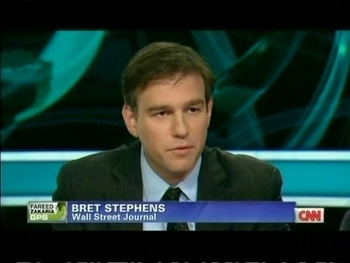 Stephens focuses on relatively minor disadvantages of the Iraq-Iran war. Seen from the perspective of a quarter-century later, the conflict did bring the major benefit of weakening both combatants. Khomeini enjoyed a vast reach among Muslims at the war's start but lost this power by its end; not a single other country experienced an Iranian-inspired Islamic revolution, and the much-feared domino effect fizzled. Similarly, Saddam Hussein's Iraq never recovered from the terrible costs of its war with Iran; although still powerful enough to conquer defenseless Kuwait in 1990, its forces were no match whatsoever for the American-led troops in 1991 and 2003. The civil war in Syria has also benefited the West until now: It set Sunni extremist against Shiite extremist, weakened the governments of Iran and Syria, harmed the Hezbollah and Hamas terror organizations, caused the malign AKP government of Turkey to stumble badly for the first time in its ten-year reign, and created troubles for Moscow in the Middle East. More broadly, a region that constantly threatens the outside world has become so focused on its own travails that its capacity to make trouble for others is reduced. As for the moral question: I emphatically agree with Stephens that we who have the means should help those in need. But does he really believe that a victory by either the Islamist rebels or the Assad government, given their horrific battlefield records, would signal an improvement in civilian conditions? I suggest instead that Western powers use their influence to get the battling forces out of the populated areas. The fighting now underway benefits those of us outside the Middle East. May it weaken both combatants even as our governments take meaningful steps to help civilians caught in the crossfire. the terrible fact remains that it is not in our power to prevent the decline of a civilization embracing over a billion people, and to prevent some aspects of that decline from turning ugly beyond description. Among the many things we might do, there is one thing we must do: limit the damage to ourselves and our allies. (2) A reader points out that my policy recommendation is old-fashioned Realpolitik ("politics based on practical and material factors rather than on theoretical or ethical objectives") and I should not be embarrassed to say so. He has a point: but I am no so much shying away from the moral task than giving priority to protecting ourselves.